Of all the Home Chef’s meals I got on my first week, this kit for jerk steak tacos with caramelized pineapple slaw was my least favorite. The biggest issue was that it wasn’t very filling. 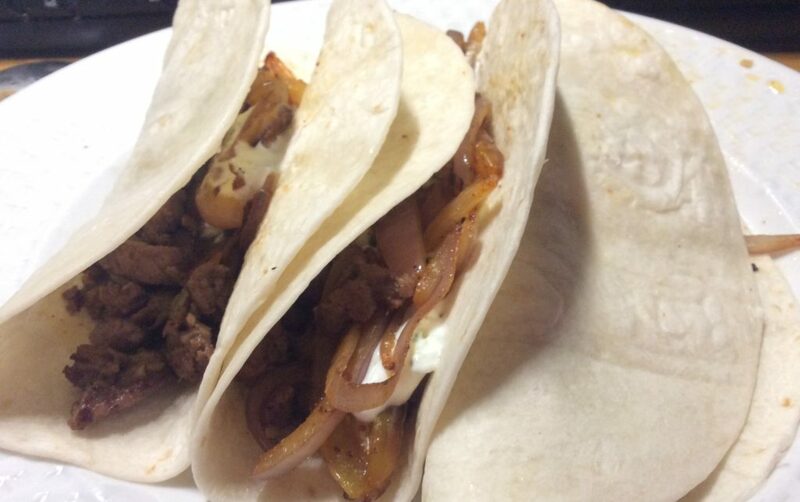 With no starches to speak of (3 small flour tortillas don’t count for much), 5 ounces of beef won’t take you very far. I also wasn’t thrilled with the flavor of the jerk sauce. Don’t get wrong, it wasn’t bad – but it wasn’t anything spectacular either. On the plus side, I did enjoy the pineapple slaw as part of the tacos. 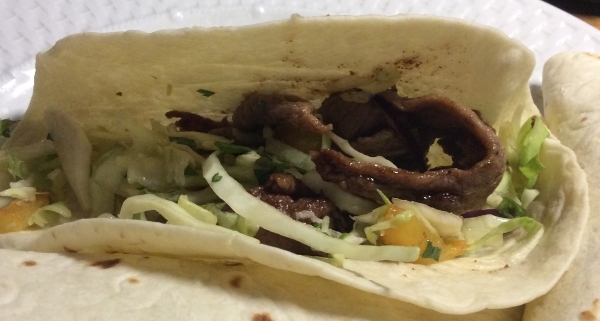 By itself, it wasn’t very good, but in the tacos it added crunch and sweetness to the meat and worked very well. The quality of the meat was good and the meal was very quickly put together. It just needed something more. I paid $8 for this meal as part of a first week deal. Regular price is $20. My oldest daughter is a vegan and I always find it challenging to know what to cook for her – or even to want to cook for her at all (fortunately, she’s learned her way around a wok). So I was very curious to see how these meal kits would work for her. Alas, while HelloFresh – the meal kit subscription I’m currently trying – seems to offer three vegetarian meals a week, they don’t really do vegan food. No matter, some of the recipes can be easily made without the diary. 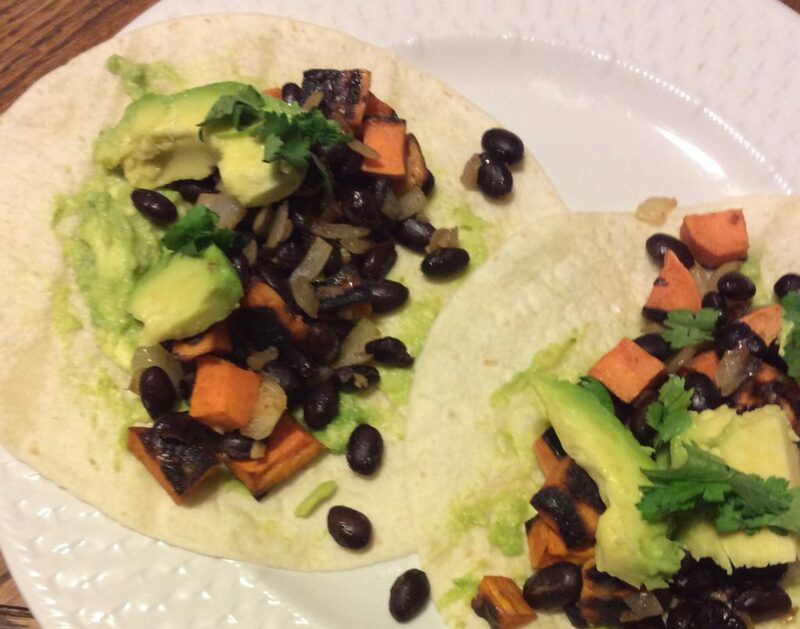 This recipe for Sweet Potato and Black Bean Tacos with Avocado Crema and Cilantro, for example, only uses diary in the crema – a blend of avocado and sour cream with lime zest and juice -, and it was easily enough to just omit the sour cream altogether and turn the crema into a simple guacamole. As this kit did not contain any meat, all the items came inside a paper bag. My first week with HelloFresh, I just put these paper bags in the fridge without bothering to open them. But after reading about wilted and missing items in HelloFresh kits, I decided to check whether all the items were there and in the right condition. That was a good idea, as I found out that part of the cilantro was wilted and that the avocado wasn’t ripe. 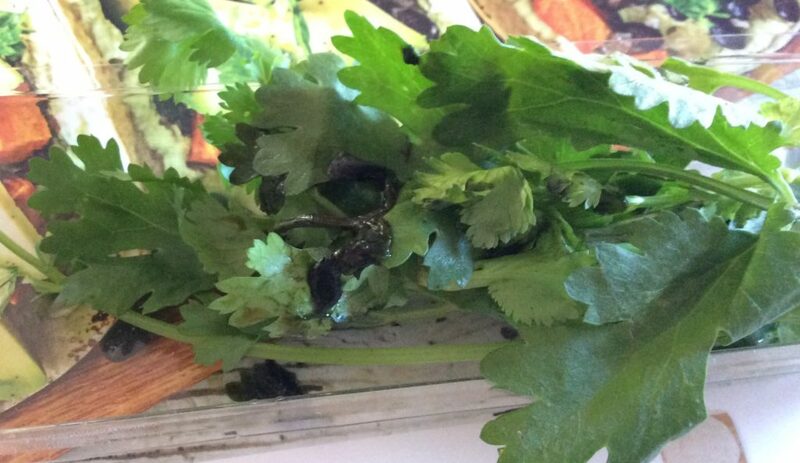 I was thus able to discard the spoiled cilantro, keeping the leaves that weren’t yet gone. 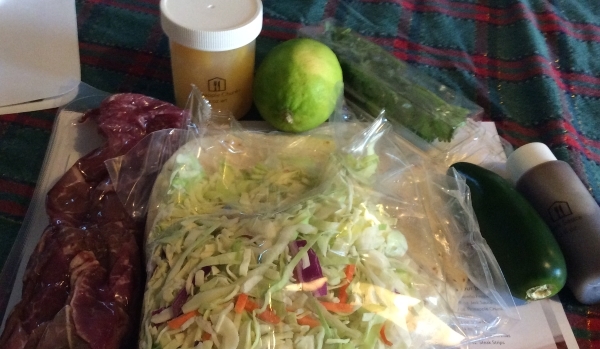 It turned out that the only item in the kit that needed to be refrigerated was the small sachet of sour cream (which I wasn’t planning to use anyway), so I was able to just keep the kit inside its paper bag in the pantry, which allowed the avocado to ripen quicker than it would have otherwise. The overall flavor of the food was underwhelming. My daughter liked it well enough, but wouldn’t be eager to have it again. Note that as a vegan, she is not particularly picky. There was too little food. 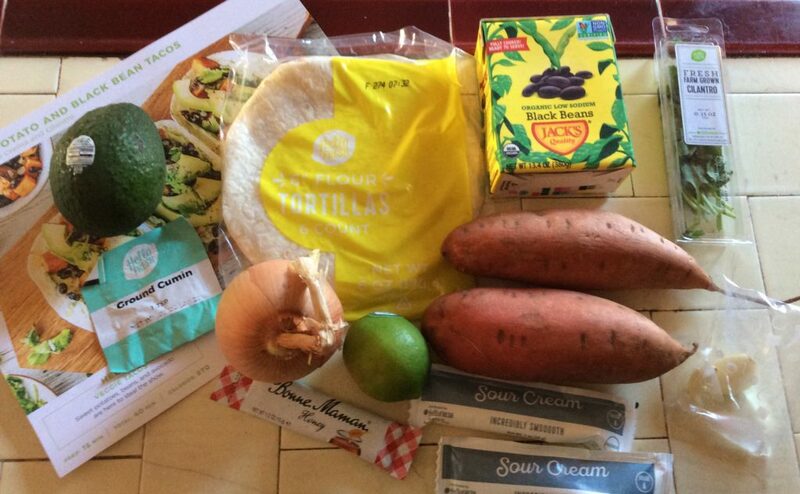 The kit has six tortilla, but enough filling for just 4 tacos – and this despite the fact that I used the whole box of black beans, and not just half as the instructions called for. 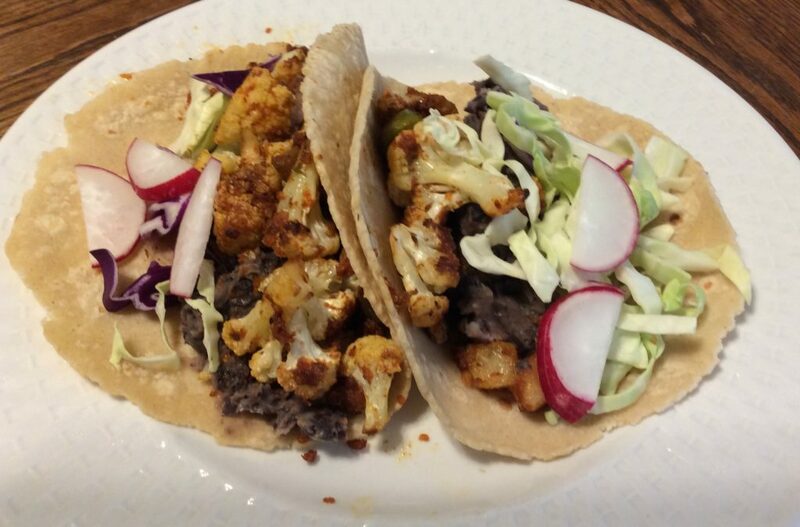 Two vegetarian tacos (and these are a little larger than those at your average taqueria) are just not enough food for dinner, without rice or something else to accompany them. Fortunately, I had made the whole kit for my daughter thinking she’d have leftovers for the next day, so she was able to eat a third taco and not go hungry. But had she had to share this whole meal with someone else, she would have been. The avocado wasn’t ripe when the kit arrived. Had I wanted to make this meal kit that day, I’d have had to go buy another avocado. Fortunately, by the time I decided to make it, two days later, it had ripened enough to use it. The avocado was too small. Really, it reminded me of the tiny avocados you can get in the California cost for 5-for-$1. There just wasn’t enough to cover 4 tacos. There wasn’t enough cilantro and part of it came wilted. I threw those parts away, but it left very little left. Fortunately, this was the only non-fresh item I’ve gotten from HelloFresh. The meal is greatly overpriced, not just in comparison with what it would cost to make this meal at home, but in comparison to the cost of tacos at taquerias (not that sweet potato tacos are that common). And those generally come with free chips & salsa. In all, because I bought this kit with a discount (and you can find an ever greater one by following my referral link) and only paid $7.50 for it, I wasn’t too disappointed. It was cheaper than what I’d spend at a taqueria. However, I’d be horrified if I’d bought it at the regular price ($22-24). For that amount of money, you can have something much better at a top gourmet Mexican restaurant.